We aim to fulfill your information needs in the present while preparing you for the future. Visit us in person or on the web to learn more about our work. Contact a member of our Library Leadership Team, if you are interested in making a donation to support the Library's work with the University of Redlands community. As the intellectual center of the University of Redlands, the Armacost Library will enrich our community by partnering across campus to nurture the scholarly and cultural life of the University and by inspiring students to engage in self-directed inquiry and the exchange of ideas in order to become effective critical thinkers and responsible doers as they strive to positively impact the world. 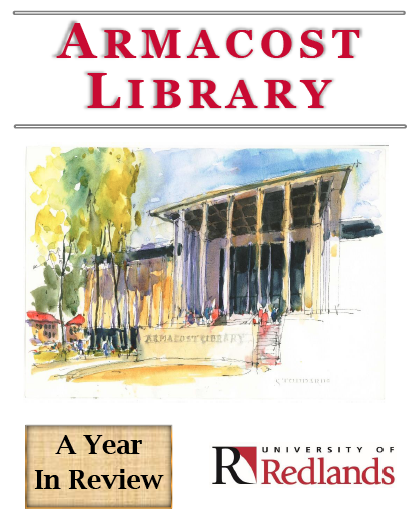 The mission of the Armacost Library at the University of Redlands is to support the teaching, research and learning goals of the University community by providing access to information resources in various formats and by promoting lifelong learning skills to identify, find, evaluate, use and communicate information that reflects a commitment to academic rigor and a better understanding of our world. ©2016 University of Redlands. All Rights Reserved.